The possibility of Apple embedding the Home button into the display of a future iPhone model got a step closer today as a third-party company announced technology that allows fingerprints to be read through Gorilla Glass. TNW reports that Sonavation has developed ultrasonic fingerprint sensors capable of 3D scanning from beneath the Gorilla Glass Apple uses for its iPhone displays. Though details on how it will work are sparse, Sonovation says its sensors are “capable of capturing fingerprint data into the ridges and valleys.” It also says 3D scanning can take place if a finger is wet, dirty or oily — all without compromising accuracy. There’s nothing to suggest any link between Apple and Sonavation – this is merely an indication that the type of technology required to replace a physical Home button with an embedded one is already out there. A sketchy report last month suggested that Apple is working on this type of technology. Don’t look for this in the iPhone 6S, though. While a recent leak confirmed our report that the new iPhone would get Force Touch, it also revealed that the external appearance of the phone will be almost identical to the iPhone 6. It’s not exactly a legit contest, as the creators of the site are only claiming responsibility for their own bounty offers. Their bounties come out to around just $200 of the approximately $20k in pledges listed on the site. All I ask is a video of the process from print, lift, reproduction and successful unlock with reproduced print. I’ll put money on this… Enroll print, Place it, lift it, reproduce it, use the reproduction to unlock the phone without being locked out… satisfactory video evidence of the print enrollment, lift, reproduction and successful application of the print without locking out will do. Only that passcode (not a finger) can unlock the phone if the phone is rebooted or hasn’t been unlocked for 48 hours. This feature is meant to block hackers from stalling for time as they try to find a way to circumvent the fingerprint scanner. You can check out all of the bounties being offered and learn more through the istouchidhackedyet.com site. Touch ID is far, far more important than most people have realised – the core message behind a Quora post by the CEO of a card payment service. We can expect to learn far more “in the next few months, and that’s likely to eventually include both Touch ID Macs and use of the fingerprint system for mobile payments. In the torrent of the billions of words already written about Touch ID very, very few people have really understood just how revolutionary this really is. Apple not only has developed one of the most accurate mass produced biometric security devices, they have also solved critical problems with how the data from this device will be encrypted, stored and secured. Apple has updated it guidelines (PDF) for case manufacturers to include specific requirements and schematics for the iPhone 5s and 5c. 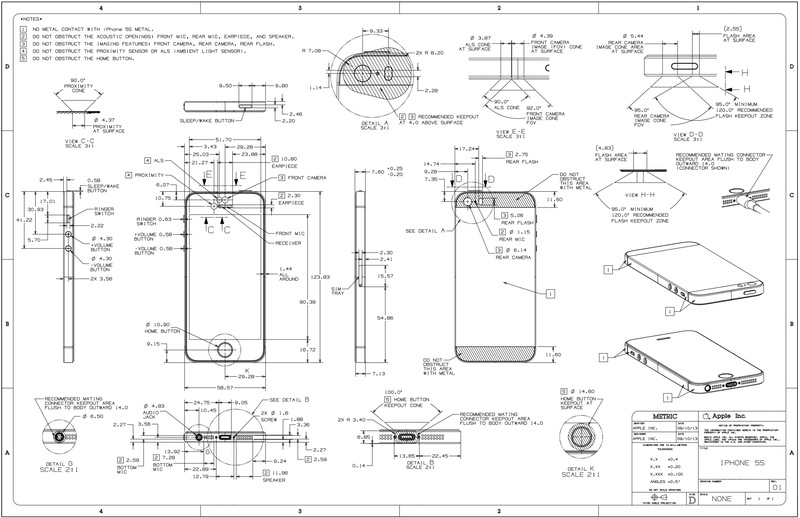 As expected, the 5s schematics are similar to the iPhone 5 since the outer shell is largely unchanged. The 5c design is more distinct from the 5, because while the internal layout is nearly identical, the exterior plastic casing is very different. See below for the 5c’s schematics.